AnaBlogs: Blogs from Analog Missions – Page 18 – NASA is associated with at least 15 analog missions throughout the world where participants are put in a situation on Earth that produces affects similar to those experienced in space, both physical and mental. These missions are helping to prepare us for near-future exploration to asteroids, Mars, and the Moon. There is so much to enjoy about living in Aquarius. For now, let me tell you a little about the food. The four members of our crew who had not previously lived in Aquarius went to a café for a great cooked breakfast on the day that our mission was to begin. We wolfed down eggs, bacon, hash-browns, grilled tomatoes, toast, orange juice, and coffee. 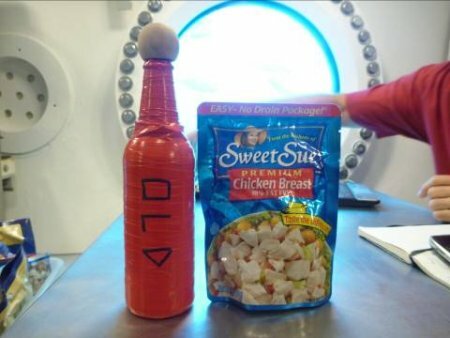 Although excited about the “splash-down” that would happen a few hours later, we all agreed that we’d likely consume fewer calories during the mission and probably lose some body mass. I mean, how good can the food really be when you’re living under the sea? Turns out we needn’t have worried. Within minutes of our arrival in Aquarius we were chowing down on a tub of cocoa-roasted almonds and we’ve not stopped eating since. If you look at the webcam of the Aquarius mainlock you will see some shelves running along the wall above the galley and table on the right. This is where the food lives. Most of it is freeze-dried and you just add hot water directly into the bag, leave it for a few minutes, and then eat it with a spoon right out of the bag. Easy. Too easy. And then there are pouches of meat, freeze-dried fruit, hot chocolate, nuts, chips, and candy bars galore. The green tub in Chris’s hand is the cocoa-roasted almonds. While James will opt for a 6am Beef Teriyaki, my breakfast of choice is freeze-dried granola and blueberries. In fact, it’s so good that I’m considering having some for dinner tonight. The spaghetti and meat sauce is particularly good with a generous topping of mozzarella and, of course, you can never go wrong with a thousand calories of mac and cheese. We even got a huge delivery of blueberry cheesecake and chocolate covered espresso beans, today! Our outstanding habitat technicians, James “It says it serves four but I can eat one all by myself” Talacek and Nate “I don’t share food” Bender, never hesitate to offer suggestions on how to make a perfectly good meal even better. Whether you are making breakfast, lunch or dinner the suggestion will invariably involve adding copious amounts of chicken, hot sauce and/or cheese to whatever you are currently eating. And they are usually right. The only disappointment is that I’ve not managed to make a good pot of coffee, yet. And no matter how many times Nate suggests it I am not going to put chicken in my coffee. Hot sauce and chicken – don’t even try making a meal in Aquarius without them. Food is a source of enjoyment for our crew, and particularly for Nate. Mission Day 4 EVAs were REALLY cool… In the morning, Chris and Steve braved the stormy seas, and Tom and Andrew followed in the afternoon. We’ve had high waves topside and the crew can definitely feel the movement of the ocean both within the Aquarius and while outside doing their underwater excursions. The focus of today’s extravehicular activities (EVAs) was to simulate operations with the various mockups that are underwater. One of the mission objectives is to test the size of the mockups, to make sure that there is enough space available for astronauts to move around and do the work that they need to do without bumping into equipment, or having difficulty. Space is a valuable commodity on exploration missions… there must be enough room to allow the astronauts to do their work, but the more space you add, the heavier the equipment and the harder it is to get that equipment off the Earth’s surface and to your destination. We have several mockups underwater that are “volumetric representatives” of NASA’s early surface exploration equipment designs, meaning that they are correct in size and shape: an exploration vehicle, lander, and ascent module. Looking down on the ascent module atop the lander. The “volumetric representatives” of the exploration vehicle, lander and ascent module. This setup allows the crew to move around and work within the mockups to test the operations aspects of our exploration mission activities. The crew commented at the end of the day that these were the most realistic EVAs that they’ve done on the mission so far, and that it really seemed like they were doing exploration activities… how cool! The Aquanauts worked with the ascent module and airlock mockups, moving between them to evaluate “ingress” and “egress” (how to go in and how to go out), and they moved small payloads into the airlock. They did several tests to evaluate how you would help an injured crewmember get back to safety. They lifted a “crewmember mockup” from just below the lander deck to the lander floor and into the airlock, testing different lifting methods. 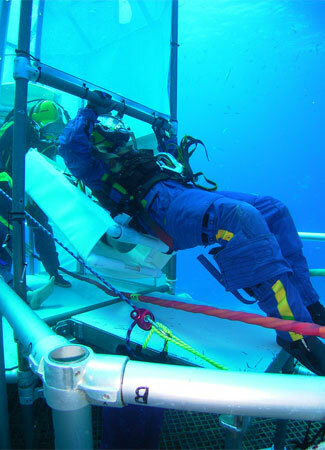 They did similar activities on the ocean floor, testing how to lift a hurt crewmember up to the rover, ensuring that they could align the life support system with the hatch. Aquanaut Andrew entering the ascent module while wearing a mock-up life support backpack. 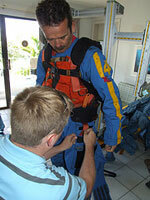 Aquanauts assisting crewmember mock-up to exploration vehicle suit port. NASA Edge was onsite today and captured a few more interviews with our topside team, and they talked to Aquanauts Andrew and Chris! During Chris’s interview, he was asked about his guitar and his passion for playing. He had a special, collapsible guitar made to take with him during his stay on the International Space Station (ISS)… and he was able to take it on this mission stay, as well. Sounds like the crew may get together this weekend for a rock session. 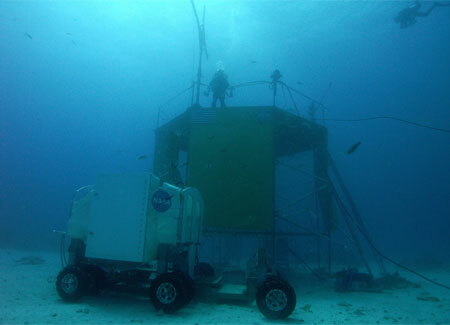 Have you seen the latest pictures from the NEEMO 14 mission? Check them out on Flickr! 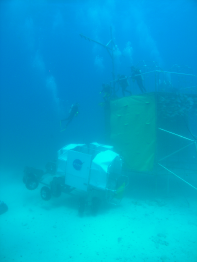 Mission Day 3 was another great day for NEEMO 14! Chris and Steve once again set out for the morning extravehicular activities (EVAs) and then Tom and Andrew teamed up again in the afternoon. We tested a different center of gravity (CG) location and ran through the same movements and tasks from Mission Day 2. Support divers setting up the CG rig on the crew for testing. 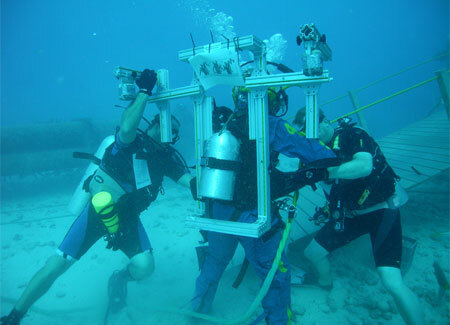 During Mission Day 3, the ETag team achieved one of their primary objectives on the NEEMO 14 mission. They successfully demonstrated realtime telemedicine monitoring from the Aquarius habitat back to the NEEMO 14 mission control center. 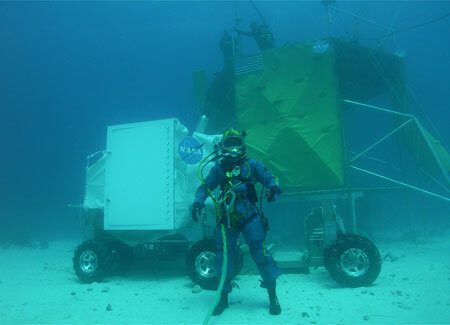 This developmental technology is being used to pioneer next-generation medical monitoring by using the ETag diagnostic platform to monitor people in a variety of extreme environments, starting with the NEEMO 14 mission. The ETag is a small, credit-card-sized, radar-based medical device that is worn on the chest. The core of the technology is the TAP (Transducer Antenna Probe) which uses RFII (Radio Frequency Impedance Interrogation) to passively gather medical data from the aquanauts. 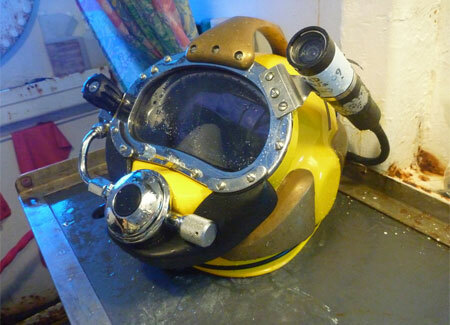 It was originally developed for combat casualty care, and is now being used to monitor the aquanauts on board Aquarius. 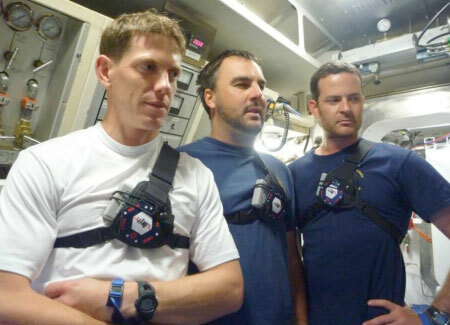 As the aquanauts continued their NEEMO 14 mission, the ETag doctor was able to medically monitor them from land. This was the first successful technology demonstration of the mission, and a giant step forward in the potential of telemedicine. The data collected from the aquanauts includes heart rate, respiration and position. The ETag also collects the environmental temperature surrounding each aquanaut. 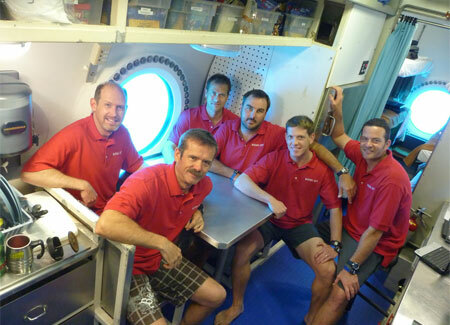 Aquanaut Andrew and the Aquarius hab techs sporting the ETags. We had another video crew on site for education and public outreach: Blair, Ron, and Don from NASA EDGE! 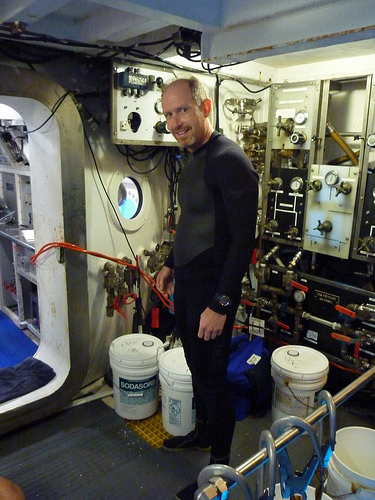 They talked to several members of our topside team, and talked directly with aquanauts Tom and Steve in the Aquarius. NASA EDGE crew interviewing astronaut Tom Marshburn inside the mission control center. One of our aquanauts, Andrew, had his birthday on Mission Day 3. The topside crew sent down several goodies for him to open, including a birthday sign, hats, a card, and a few games that the crew can play in their (little) down time. During our evening tag-up meeting with the crew, we were able to sing him happy birthday! 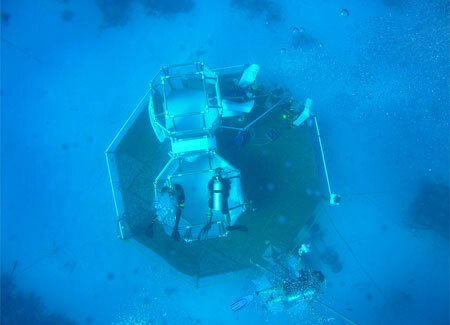 What an awesome way to spend your special day: doing EVAs 63 feet under the Atlantic Ocean, paving the way for future exploration and being one of the elite few to have the opportunity to live in the Aquarius habitat. The NEEMO team, consisting of two astronauts, a veteran undersea engineer and an experienced scientist and two NURC hab techs. Steve Chappell gets ready for his dive. The crew was able to celebrate two different kinds of orbits today (May 12) simultaneously. We helped Andrew (Abercromby) celebrate the completion of his 30th trip on the Earth around our Sun. And, thanks to the topside support’s surprise delivery, we even had ice cream and party hats after dinner to celebrate his birthday. We also were able to link up with the International Space Station in orbit around the Earth and talk with Japan Aerospace Exploration Agency (JAXA) astronaut Soichi Noguchi and NASA astronaut Tracy Caldwell Dyson. We marveled at the ability to link up fellow explorers in space with us at the bottom of the ocean. It was particularly special to patch Soichi through to Andrew and Tom (Marshburn) who were out on EVA (extravehicular activity) developing ways to send humans out into the solar system, as if they were phoning home from the surface of an asteroid, moon, or planet. It brought a great perspective and served to further remind us of the amazing expedition we are on both as aquanauts and as we work to help the human race expand into the universe. Mission Day 2 was our first day of science extravehicular activities (EVAs). 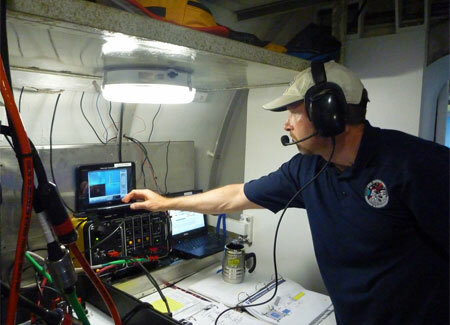 The focus of today’s underwater excursions was to evaluate one of the center of gravity (CG) locations on the CG rig. Chris and Steve kicked off the EVAs in the morning, Tom and Andrew followed up in the afternoon. During the CG tests, the crew goes through a series of movements and tasks that will be repeated throughout the mission, but on each EVA the location of the weights on their back is different. These movements include basic things like walking, running, and jumping… they do this on the sea floor (level ground), and they also walk up and down a ramp. They kneel down and stand up, and pretend to fall down and get back up. 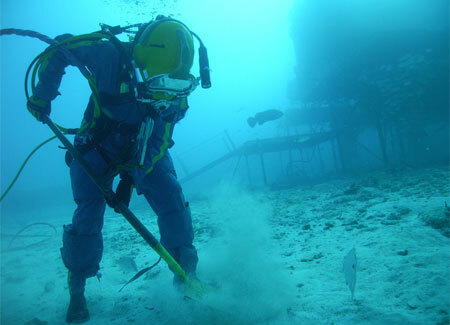 The Aquanauts are also testing several movements that astronauts would do if they were on a planetary surface, specific to sample collection and science, such as moving rocks and shoveling. 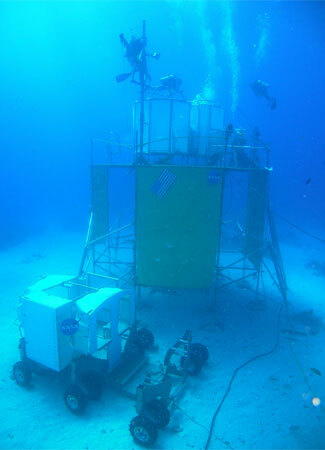 We’ve got a full-sized mockup of a lander underwater (cool! ), and the crew is going up and down the ladder, testing how easy/hard it is to move up and down the ladder at angles of 10, 20, and 30 degrees. At the top of the lander there is a crane that the Aquanauts use to test how to lower the rover and small payloads (packages) down to the sea floor, similar to what they would do if they just landed on a planetary surface and were “unpacking” equipment to the surface. Amazing views of the crew with the exploration rover and lander mockups. It was really fun to watch the EVAs from the Mobile Mission Control Center. We can hear the audio from the two Aquanauts, and we can watch them via the various webcams. Aside from watching the crew work through their EVA tasks, it was cool to see the variety of fish swimming around, also observing the EVAs! The fish were particularly curious when we started driving the Remotely Operated Vehicle (ROV). The ROV is our underwater robotic assistant, equipped with a camera… Mary Sue, Amanda, and Heather took it for a spin in the morning to practice driving from topside, and whenever we stopped, the fish happily swam over to check us out! At one point we saw two stingrays “fly” by… incredible! We had a video crew on site in the afternoon, and we collected interviews with Nick, Juniper, Lesley, and Astronaut Mike Gernhardt, and we even talked to Chris in the Aquarius! 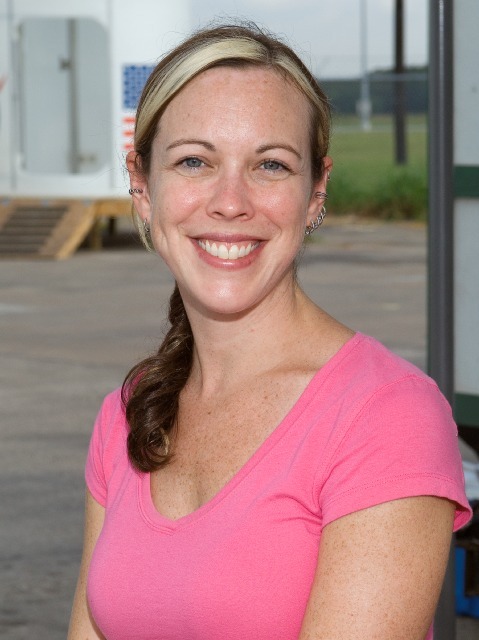 (To learn more about our team, check out our bios). We hope to post these videos on YouTube soon, so stay tuned! Heather interviewing CSA Astronaut Chris Hadfield in the NASA Mission Control Center. Three schools had the unique opportunity to work with Mary Sue and Amanda to drive the ROV, view all of the amazing and colorful fish, and see the habitat from the ROV cameras. During our live webcast with Richland Middle School (Richland Hills, TX), the students were actually able to view the Aquanauts with the CG rig performing a few of these tasks from the ROV cameras. We were also able to visit with The Odyssey Academy (Bryan, TX) and Milstead Middle School (Pasadena, TX). Mary Sue and Amanda visiting with the students during the live ROV events. During Mission Day 8 (May 17) we will also be hosting NASA Digital Learning Network (DLN) live webcasts which will include live questions and answers with the Aquanauts. To view these shows, please visit the NASA Digital Learning Network website. What an exciting day! The mission is officially a GO! The Mobile Mission Control Center was buzzing as the mission support team awaited the crew’s departure… We waved from the dock as the boat pulled away to send the NEEMO 14 crew to their underwater home for two weeks. After all of the equipment and supplies were brought down to Aquarius by the support divers, the crew took one last look at the sky and sun, and then DOVE down to the 60 foot depths! It was cool to watch the Aquarius webcams, which show views of the inside and outside of the habitat… For a while we saw only fish (and a LOT of them), but then suddenly we saw our NEEMO 14 crew! 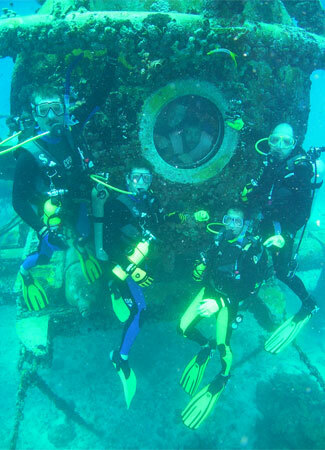 The NEEMO 14 Crew. Outside the Aquarius from left to right: Commander/CSA Astronaut Chris Hadfield, Andrew Abercromby, NASA Astronaut Tom Marshburn, and Steve Chappell. 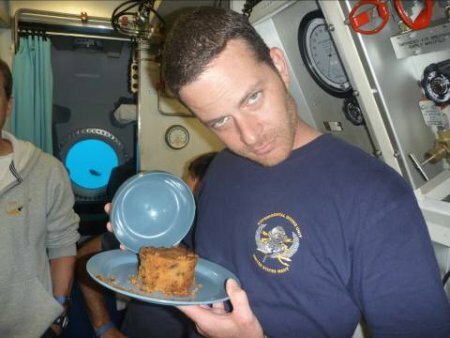 Inside the Aquarius: Habitat Techs James Talacek and Nate Bender. The crew entered the hab, and the first order of business was to get unpacked, oriented in their new home and perform communication checks between the Aquarius and the topside crew supporting the Mission Control Center. After a quick lunch, it was time to get to work. Steve Chappell working inside operations during Mission Day 1. 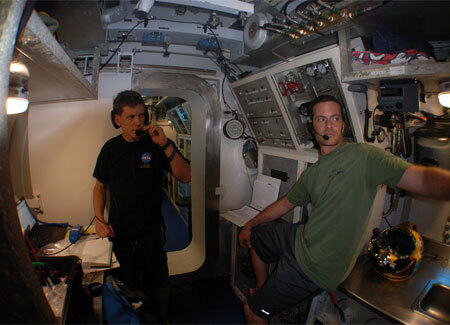 (L) Aquarius Crewmember Andrew Abercromby and (R) Habitat Tech Nate Bender performing communication checks with Mission Control. Commander/CSA Astronaut Chris Hadfield and Steve Chappell were the first crewmembers to kick-off the extravehicular activities (EVAs) for the mission. During their excursion, they performed dives to become familiarized with the SuperLite dive helmet, various experiment mockups and the surrounding environment that they will be working in over the next two weeks. Up close and personal with the SuperLite helmet. Crew familiarization of surroundings, procedures and mockups during Mission Day 1. 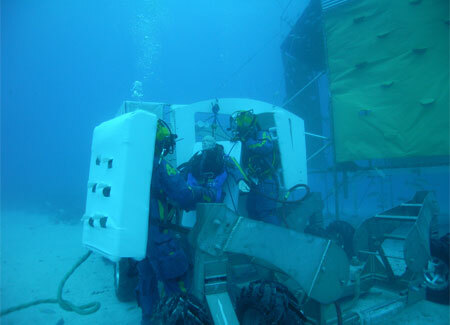 Once the first EVA was complete, NASA Astronaut Tom Marshburn and Andrew Abercromby ventured into the depths of the ocean to perform the same familiarization tasks and prepare themselves for the major EVA tasks ahead. Following the EVAs, the crew members were able to get back into their new home to complete their reports, eat some spaghetti and relax for the next big day! Our crew runs through the steps to lift the rover from the sea floor to the lander deck. After a very long day of training and preparation tasks, Training Day 4 came to a close with a deep sigh of relief from the team…It was a VERY busy Friday! Sunday evening we met once again as a full team, topside support and crew, to run through any final details of the mission. There were only a few things left to be worked, but overall we were ready. When I left the Mobile Mission Control Center, I felt both anxious and excited…this mission is going to be REALLY AWESOME! The team has planned an incredible mission full of fantastic activities that are educational, scientific, and in line with NASA’s exploration goals. WE ARE GO FOR NEEMO 14! 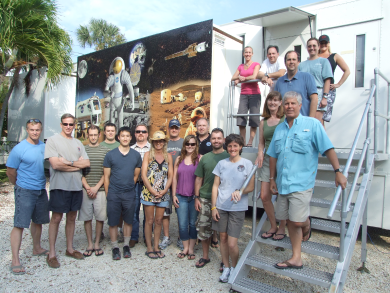 The mission support team is topside in Key Largo, working inside NASA’s Mobile Mission Control Center to track the NEEMO 14 mission activities.